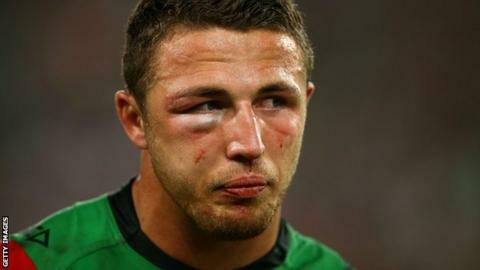 England international Sam Burgess will finish his playing career in the National Rugby League with South Sydney Rabbitohs after signing a four-year extension to his contract. Burgess, 29, has played 160 games for Souths in two spells and was a key part of their 2014 Grand Final success. The former Bradford Bulls forward won the Clive Churchill Medal for man of the match, despite a broken cheekbone. "The club aligns with everything I'm about and my values, so it was an easy decision for me to extend my contract out to the end of my career." Burgess is a dual-code England international, having also played for the union side during a season at Bath in 2014-15, and has appeared in World Cups in both codes. He first joined Souths in 2010 and his brothers Luke, Tom and George have also worn the cardinal and myrtle for the club. Winning the Churchill Medal in 2014 brought comparisons with another Souths legend in John Sattler, who inspired the team to their 1970 Premiership win with a broken jaw. And Burgess has become one of the most consistent and respected players in the elite NRL and was also named Lock of the Year in the 2014 Dally M player awards.